Here is a great recipe for healthier Halloween treats the whole family can enjoy – spider and ghost banana pops! Kristen Smith of 360FamilyNutrition.org is sharing this delicious Halloween treat recipe with us. These Halloween pops are fruit based, with a banana serving as the body. The body is dipped in or drizzled with melted chocolate. Kristen Smith has added mini chocolate chips and marshmallows, but you can choose to decorate them as you please. 4. Re-melt chocolate and spread over banana; add additional decorations before chocolate dries (I used marshmallows and mini chocolate chips for eyes). I hope you enjoy these delicious healthier Halloween treats. 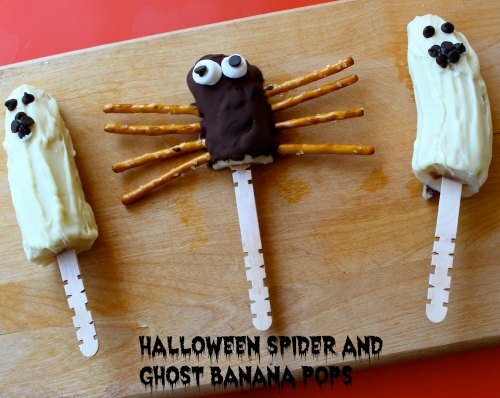 I think these spider and ghost banana pops will be a hit at any Halloween party! If you are looking for more healthier Halloween treat ideas to serve at your Halloween party, you will also enjoy this super easy Candy Corn Veggie Tray! 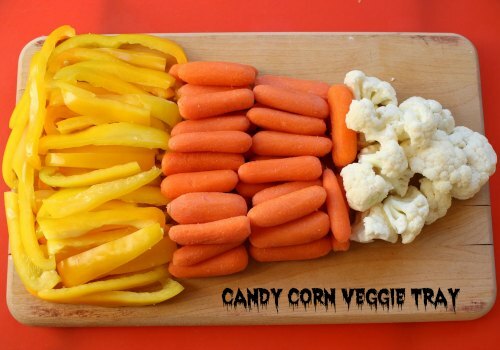 Arrange as in the shape of traditional candy corn, separating different veggies. Serve and enjoy! Thanks again to Kristen Smith, who is a registered dietitian based in Atlanta, GA with over eight years of experience in nutrition counseling and consulting for weight management, for sharing these recipes with us. 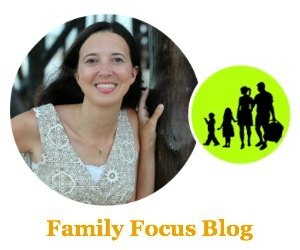 She is the founder of 360FamilyNutrition, a blog dedicated to promoting healthy eating within an entire family. Wow! This is a real treat :)_ Can’t wait to make these for my little ones! These are super cute. I am going to make the veggie tray. My youngest started eating pickles… so I am going to encourage other veggies with a little spritz of pickle juice. My hubby thinks I am nuts, but I am determined. Adorable pops. Ghost banana pops are so much better than ghost banana pepper pops..unles you want to play a trick vs. give a treat! These are so cute. I love the chocolate covered bananas. Love the veggie tray, but how is adding chocolate to bananas a healthy snack?